I am in favor of profanity. There are no bad words, I tell my kids, only bad intent. The catharsis of a well-placed expletive is often worth the risk of offense. But language does matter. The words we choose do not just reflect the state of our minds. They have the power to change it. Indeed, many of us wear our busy-ness like a red badge of courage. We are strangely proud of it and even congratulate each other for it. So it is no wonder that many of us have come to tie our worth as attorneys, investment bankers or business owners to how busy we are. I get it. Our responsibilities can feel overwhelming at times. But the danger is that this word—busy—is altering how we choose to value and apportion our time. And whether we even see it as a choice. 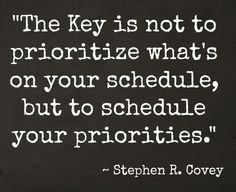 We have all experienced how busy-ness tends to excuse procrastination on what we would like to be our priorities. What we face in its absence are the things we suspect matter more to our present and future success, health and happiness. Why haven’t I written and published that article? When will I call that prospective client? How can I follow through on my commitment to get to the gym twice a week? What is the most I have slept on consecutive nights in the past month? When is the last time I spent a worry-free day with my spouse? Kids? Friends? When was the last time I meditated, prayed or just sat in quiet contemplation for 10 minutes? When we repeatedly and instinctively allow busy-ness to stand in for making an impact and cite lack of time as an excuse for not taking care of our most valued priorities, we train ourselves to accept the “quiet desperation” of quantity over quality. We convince each other that our obligations are necessary evils to be endured bravely. And we teach our kids that none of this is really a choice; that they, too, are at the effect of the world around them rather than responsible for creating the reality they wish to inhabit. For these reasons, I have been working to banish “busy” from my vocabulary and my work. I am choosing my words more carefully and purposefully making time for what matters most. And when I can’t figure out what matters most, I do my best to find a quiet place (the bedroom, the car, heck, the toilet, if that’s what it takes) to sit still for a few minutes and do nothing at all. Idleness is not just a vacation, an indulgence or a vice. It is as indispensible to the brain as Vitamin D is to the body. And deprived of it, we suffer a mental affliction as disfiguring as rickets. The space and quiet that idleness provides is a necessary condition for standing back from life and seeing it whole, for making unexpected connections, and waiting for the wild, summer lighting strikes of inspiration. It is, paradoxically, necessary to getting any work done. But I want to hear what you think. What is one thing you can do today to be less “busy” and more purposeful with your time? How might your clients, firm, business or family benefit from a shift in your priorities? Leave me a comment below and, if you’d like my help getting more out of what you want from work and life, shoot me an email at brian@atgcoach.com. The quotes from Tim Kreider were pulled from an essay called “Lazy: A Manifesto” (an audio excerpt of which you can listen to here) in his outstanding compilation, We Learn Nothing. Thanks again to Tim Ferriss, whose consistently excellent blog and always thought-provoking podcast served as my introduction to Mr. Kreider’s work. This entry was posted in Mindfulness, Professional by Brian. Bookmark the permalink.